Igado is an Ilokano dish and the original recipe consists of pig’s internal organs. 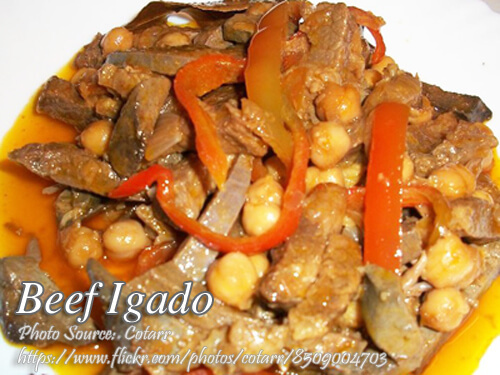 If there is no available pork internal organs in your marketplace, or if you abstain from pork, you can try this beef igado recipe. To give you a summary on how it is cooked, you will need beef (the meat), beef heart and beef liver. You also need to boil the hear and liver first to remove the musky odor. Just half cooked. Slice the meat, heart and liver into strips. Saute the meat in garlic and onion for a few minutes. Add the heart and liver then stir fry. Add water and simmer until tender. Add pepper and laurel leaves then pour vinegar and beef cubes. Add the annato, chickpeas and bell pepper. Simmer then season with salt ot patis. Boil the heart and liver to remove the anggo or musky odor but don't cook it too much, just half cooked. Slice the beef, heart and liver into strips and separate the beef from the heart and liver. Saute garlic and onion then add the beef and stir fry for a few minutes until the liquid evaporates. Then add the heart and liver and stir fry for at least 3 minutes. Pour a little amount of water and simmer until the beef, heart and liver becomes tender. Add pepper and laurel leaves. When the liquid evaporates again, pour the vinegar and add the beef cube. Add the atchuete and stir for at least 3 minutes. Follow the chickpeas and bell pepper. Simmer again for at least 3 minutes and season with salt or patis. Adjust the amount of the salt or patis that suits your taste. Serve hot. thank you for giving us easy to learn how to cook?